Skype Recorder Lite Version is the simplified version of AthTek Call Recorder for Skype Pro. It has a smaller interface and you can change color of it. Skype Recorder Lite removed some seldom used functions like FTP Uploader, auto answer, etc. It has the same audio call recording quality to AthTek Call Recorder for Skype Pro. If you are looking for a Skype Call Recorder which is small, easy to use and can record Skype calls in high-quality audio files, please download and try Skype Recorder lite version. You will find it is just what you are looking for! If you need a Skype Recorder for business use, please use the platinum version (Pro). 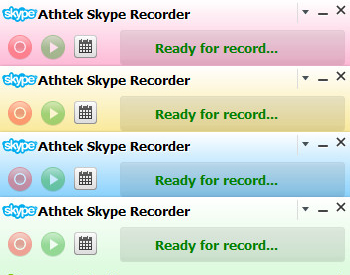 If you want to have a try with the Pro version of AthTek Call Recorder for Skype, go the download page by clicking here. Smaller size: The Pro version took much space on your desktop, while the lite version removed history box from interface to make a clean GUI. Simplify functions to meet private use: Lite version has removed some seldom used functions and make itself more customizable for private use. Lower price: Skype Recorder lite is very cheap, maybe it has the lowest price in all the Skype Recorders. You only need to pay $15 and you will gain a best quality Skype Recorder. Flexible update service: If one day you feel the Skype Recorder lite cannot meet your needs any more, you can update it to the platinum version (Pro) as you wish. Simply click here to update it to platinum version. Yes! I want the 30-day Money Back Guaranteed Full Version Skype Reocrder Lite for $15. I'll place the order now and have a new experience in using Skype. Have a look at the interface types of Skype Recorder lite version. Below is a combination with four colors Skype Recorder lite. Actually, you can switch it to any color you like. You can see that the size of interface has been compressed to 350*98 pixel, while the recording quality has been reserved at high level. It is more suitable for private use, and It is able to record Skype calls automatically too. Below is the relationship between Skype Recorder licenses and versions. Lite license can only register the lite version, while the platinum license can register both lite and platinum version. If you want to upgrade lite license to platinum license, you need to pay an upgrade handling fee $19. If you feel that Skype Recorder lite license cannot completely meet your needs, you can easily upgrade it to Pro lincese, then you would be able to use more functions including FTP Uploader, anto answer, stealth mode, adding notes and offline recording. Simply hit the below button and you will get your license updated. Yes! I want to upgrade my Skype Recorder lite license to the Pro one. I will pay the update handling fee $19 now and have more function included into my Skype Recorder. If you want to refund someday, the update handling fee could not be included. Only the primary lite license fee is refundable.